I thought it was a badge of motherhood. No sleep. Complete and total exhaustion. Every single day. For 17 months. Then everything changed. From as early as I can remember until almost exactly one year ago, Christian was up throughout the night- most nights every hour. He would only nap if he was on the move in the stroller, in my arms or if I nursed him to sleep. I read recommended sleep books, looked at the Facebook mom groups, researched online, but couldn’t seem to implement the suggestions. I (kind of) tried “cry it out” but just couldn’t bear it. Working full time with a husband who worked like crazy with no solid sleep– I was in constant survival mode. I’d do anything to get him to sleep. I pretty much fell asleep with him every night. Once he fell out of my bed. I am still traumatized and can still hear that horrible thump. It was so awful. After that, I would actually climb into his crib and sleep with him in there. Here’s video from my Canary cam to prove it! I am by no means a violent person but I wanted to punch every mom I met who bragged that her kid slept through the night. My relationship with my husband suffered. We all suffered from no sleep…. for 17 months. 14 months in, I became critically ill. That story is for another post. I ended up hospitalized and out of work for months. I knew I needed to sleep to get better and heal… I was desperate. I posted something about needing sleep help on my Instagram story. A former co-worker responded saying a friend was going to try this company but never did. I googled it. It was a national company. I went to the “meet our team” section and I saw a photo of a kind looking face and a hometown that was very close to where I live. What were the chances? I clicked the link for a free 15 minute phone evaluation. Hours later I was on the phone with Allison Ambort Gubelli for almost an hour. There was something about her that I trusted and felt good about. I thought my husband wouldn’t agree to pay the money or think I was crazy to want to hire a “sleep trainer”. I was wrong. He said to sign us up, get her over as soon as she could get here and let’s get started. And let’s get sleep. He was desperate too and about to travel for a week for basketball season (he is a College Basketball TV Anaylst). I filled out a very detailed questionnaire. A few days later Allison came to my house. It was like we were old friends. She started out by making sure Mo and I were both fully committed to what was about to go down. I was nervous… selfishly I was scared I would miss our snuggle time and co-sleeping (which I loved minus the fact that I couldn’t get real rest because Christian rolled and kicked and woke up a ton of times)… she assured me that there would be other snuggle times and that we wouldn’t lose our bond (she was right) … I almost backed out but I felt like at that point I had to go through with it. She went upstairs to Christian’s room first. She moved things around. Adjusted the temperature. Took everything out of his crib. Blacked out the windows with oak tag and changed the “sound” on our sound machine. Then it was game on. We began our new nighttime routine that we still do now- bath, book (2 books) and bed. Oh yeah, and no screen time before sleep time. She told Mo and I exactly what we had to do and held our hand (literally held my hand at many points) through it. For us that first night, one of us was allowed to sit in the chair next to the crib. I know she makes different plans for every child depending on age, needs, etc. So for us, she thought it was best that Mo stay in the room and I stayed downstairs with Allison and watched on the monitor. I don’t know who cried more that night…. me or Christian. It was awful and heartbreaking and emotional to watch. Christian finally fell asleep, Allison went home, and then every time he woke up that night we followed her plan. Thank goodness I had her to text for support and some of my other girlfriends (luckily one in a different time zone so she was up to text!) throughout the night. It was horrible. I wanted to quit. Thank goodness my husband is stronger than I am and made me stick to the plan. The next three days were torturous hell. We kept detailed logs of his progress which at the time was not great. I was losing hope. We had conference calls for support. My nanny at the time didn’t agree with what we were doing and ended up quitting (I now see there were other issues too). I was heartbroken. I was still very ill. I was exhausted – physically and emotionally. And Mo was about to leave for a week. We were in a bad place. Then on Day 4- a minor miracle happened. 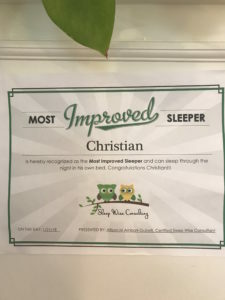 Christian went down for a 2 ½ hour nap on his own without crying…. And then went right down at bed time and slept a straight 11 hours through the night. What? I thought it was a fluke. Next day, same thing. And for a year, yes we’ve had off days and nights, but pretty much that is what it has been like. 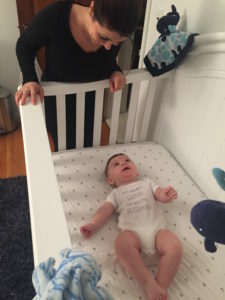 He started to love his crib and even would ask to go to sleep. Life changing. For all of us. The best part is that I quickly saw a change in him. He was a happier kid. His development went into high gear. What a difference sleep made. I never thought I was one for a “schedule” but knowing when he naps and goes to bed allowed me to have more structure in my life and house and get so much more done. Now that he has those independent sleep skills we can be more flexible. A month after we completed our sleep training, Mo had to travel to Boston for an overnight and I decided to go with him for a change of scenery and mental health. We were so nervous because it was the first time we would be breaking our routine. We brought Christian into the hotel with his sound machine and blanket. We did our nighttime routine and he went right into the pack and play and slept 11 hours. We were amazed. I’ve shared this new sleep knowledge with my sister and many friends and they all now have kids who sleep too and swear it was worth every dollar and every tear. I share this with you because I wish someone shared it with me way sooner. With this new baby coming, I will definitely do things differently this time around- for all of our sake. We all need sleep. Sometimes we don’t realize how important it is until we don’t get it. I have no idea how I did without for that long. I realize now that I was totally depleted and miserable. Having a new baby is hard enough as it is. Getting sleep back again was truly life changing. So I write this so if you are going through something similar, know that there is help out there! As we get ready to move from a crib to a big boy bed any day now, I’m getting super sentimental about our journey. I hope this next transition is an easy one. When we received our sleep certificate almost exactly one year ago, someone (maybe even me I don’t remember) put it up on a piece of furniture in my dining room with tape… I’ve thought about taking it down but every time I pass by it, it reminds me of just how far we’ve come. If you need some tips, check out the Sleep Wise blog. I actually just read this one about our next step! Allison also shared these sleep tips with me when we had her on our Facebook Watch Show to talk about getting on a back to school sleep schedule a few months back. TIP 1: set an age appropriate bedtime. Up until puberty, (12/13 years old), children need between 10-12 hours of sleep each night. To make the adjustment, move bedtime 15 minutes earlier every 3-4 days until you reach your ideal bedtime. Be patient, it’s a process and it can take time to come together. Bedtime routines are absolutely crucial in fostering healthy sleep habits because it acts as a cueing system to get our brain and our body ready to transition and prepare for nighttime sleep. Bath/showers, PJs, brush teeth, reading with a parent or on their own (10-15 minutes) and lights out. You want to aim for your bedtime routine to take roughly 30 minutes in length, maybe a little bit longer for older kids; however, anything longer than that leaves an opportunity for overtiredness or overstimulation depending on what their reading and how cooperative they are with settling in. TIP 3: No screens at least 1 hour before bed. No TVs, phone, video games, tablets, laptops, computers, etc. The number 1 reason that children, adolescents and even adults are having sleep issues is screens. The reason is, when we’re looking at screens, we’re blasting light into our eyes. This exposure to light sends signals to the brain to delay the release of hormones like melatonin which is associated with sleep onset and is produced when the eyes signal to the brain that it is dark. Since the receptors in our eyes send signals to our brain to inhibit or release certain hormones based on exposure to light, one thing to help ease the transition to an earlier bedtime in the presence of a late sunset and early sunrise is a dark bedroom. Happy National Pizza Week …which is every week in our house!